Raleigh, N.C. – Republicans in the North Carolina General Assembly will pass more tax cuts for middle-class families across the state this year, building on historic tax relief and reforms that have helped average and low-income earners keep more of their paychecks since 2013. More than 30 members of the House Republican super-majority have co-sponsored the Tax Reduction Act of 2017. The North Carolina Senate has already passed a billion-dollar tax cut plan of its own in Senate Bill 325. General Assembly lawmakers are expected to negotiate a compromise tax cut as the 2017 state budget takes shape this legislative session. 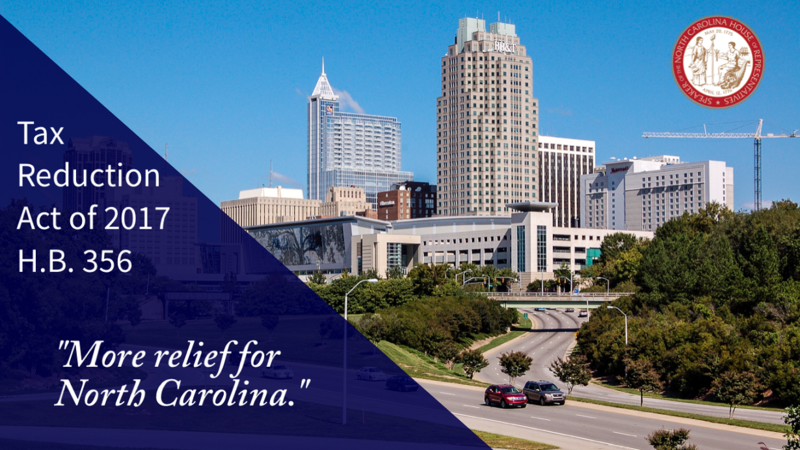 Sponsored by four House Finance Committee chairs, the Tax Reduction Act of 2017 would leave even more money in the pockets of middle-class North Carolinians and let small businesses reinvest their earnings, creating jobs and economic growth. House Bill 356 – the Tax Reduction Act of 2017 – would raise North Carolina’s standard deduction from $17,500 to $18,500 for married couples filing jointly and from $8,750 to $9,250 for single filers, tripling the state’s zero tax bracket since 2011. The zero-tax bracket under Democrat control was only $6,000 for married couples and $3,000 for single filers. The income tax relief in the Tax Reduction Act of 2017 is expected to save taxpayers $64.5 million in the 2017-18 fiscal year and $124 million in the 2018-19 fiscal year. “Republicans in the House of Representatives will continue providing tax relief to low-income earners, the middle class and small businesses in North Carolina this year,” said Speaker Tim Moore. North Carolina Republicans have cut taxes for families and businesses by over $4.5 billion this decade, and the state reported a $552 million budget surplus in February 2017. In 2011, General Assembly leaders resisted demands from then-Governor Perdue to permanently install a $1 billion annual sales tax increase. State taxpayers enjoy a lower and consistent 4.75 percent sales tax rate on all their purchases under Republican leadership, in addition to significant income tax reductions. Despite being handed a $3 billion budget gap for the 2011-12 fiscal year, North Carolina General Assembly budget writers also provided nearly half a billion dollars in small business tax relief. North Carolina’s estate tax – also known as the “Death Tax” – was repealed January 1, 2013. Beginning in January 2014, the individual income tax fell from a top rate of 7.75 percent to a simplified, single 5.8 percent rate. Along with lowering rates, a larger standard deduction of $7,500 of income for singles and $15,000 for married filers was created. In 2015 the North Carolina General Assembly cut personal income taxes for the second time in three years. Starting in 2017 North Carolina’s personal income tax rate dropped from 5.75 percent to 5.499 percent and the standard deduction increased by $500. North Carolina’s corporate tax rate – formerly highest in the southeast at 6.9 percent – was reduced to 6 percent in 2014, 5 percent in 2015, 4 percent in 2016 and 3 percent in 2017. Among states that have a corporate tax, North Carolina now has the lowest in United States.